I decided to buy especially it saying max weight 100lbs and I'm so glad I bought it. It's fits my 1 year old and 5 year old. Now I know soon my 5 year old will be soon uncomfortable but he says he's fine in it now. They love the morning ride to school and my 1 year old is just so calm the way there and back. This is an awesome trailer. 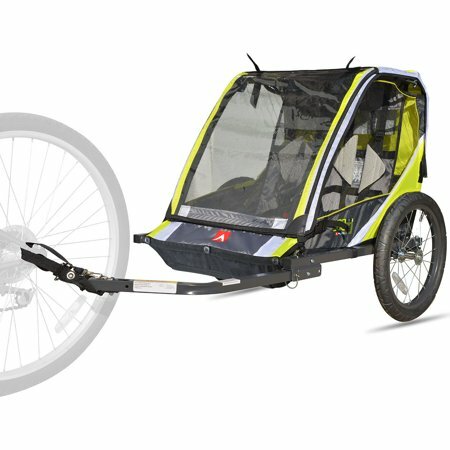 I was a little unsure about what I would be getting for under $100, but have been blown away with the quality and value of this trailer (or as we call it in our house, "the Green Machine"). I only use it for my 3-year old son, but there is tons of room inside. The padded safety harness is comfortable and keeps him safely in place. The huge windows on this trailer are especially nice because they keep him entertained when we are out exploring. I use it 4-5 times a week to bring him to pre-k and it has held up really well so far. Works great! Love that i can easily take it off my bike and make it a stroller. Fits my one year old and his three year old cousin with room to spare! Love the extra storage space in the back. Worth the money! It is a little hard to understand the directions but I was able to figure it out on my own. Very fun way to ride around with my son. I have had this for a while and its still holding up well. My son enjoys it very much. Its easy to latch on to my bike and very light so it pulls easily. Wheels come off easily and it folds flat so its easy to store. I bought this when i was sale for and it has worked out great. the bike rides freely the trailer does it thing. I can fit 2 kids back there easily and they enjoy the ride. The kids are getting a little big (6yrs) so the oldest would like a little more leg room but the smaller kids will find it to be plenty of space. there's extra room for storage as well. The trailer is easy to assemble and disassemble.